Very inspirational quote about Success and failure. Dreaming about success is good, but dealing with failure is tough, right? that too.. being focused and positive after failure is still tough. There will be some phase in everyone's life when we go through many failures one after the other. This phase tests our patience and confidence. If we can stand against storm and work without losing enthusiasm at that phase, everything will be fine. Anyway, low phases of life doesn't stay all the time. Whenever I think about success and failure, I remember another quote from Thomas Edison. 2 quotes on same post :-) Fine, but these two quotes are very much related. I remember this quote whenever I fail. I can relate this especially to my cooking. I was so bad at cooking at one point of time and lacked confidence that I found all possible ways to spoil a dish :-) Ok, but many lessons learnt, from the experience. 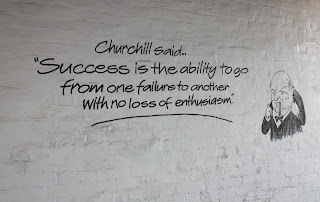 So, that's about two inspirational quotes that I love on success and failure. Thanks Corinne for nominating me for 3 day quote challenge. :-) I am not tagging anyone for the challenge, as i am taking this for the second time. However, feel free to take this challenge, below are simple steps for this challenge. Image courtesy: from creative common license flickr search.